Print poster, facebook profile cover, and social media designs for the University of Delaware’s Fall 2018 concert featuring Smallpools. Print posters outlining the spring 2019 semester’s topics and hosts for the University of Delaware’s weekly trivia series. Print poster, facebook profile cover, and outdoor banner for the University of Delaware’s annual senior festival. 2018’s event was galaxy themed. Various print posters for miscellaneous events hosted by SCPAB (Student Centers Programming Advisory Board), an event programming board at the University of Delaware for whom I am the VP of Design. Includes individual event posters, monthly calendars, and semesterly calendars. 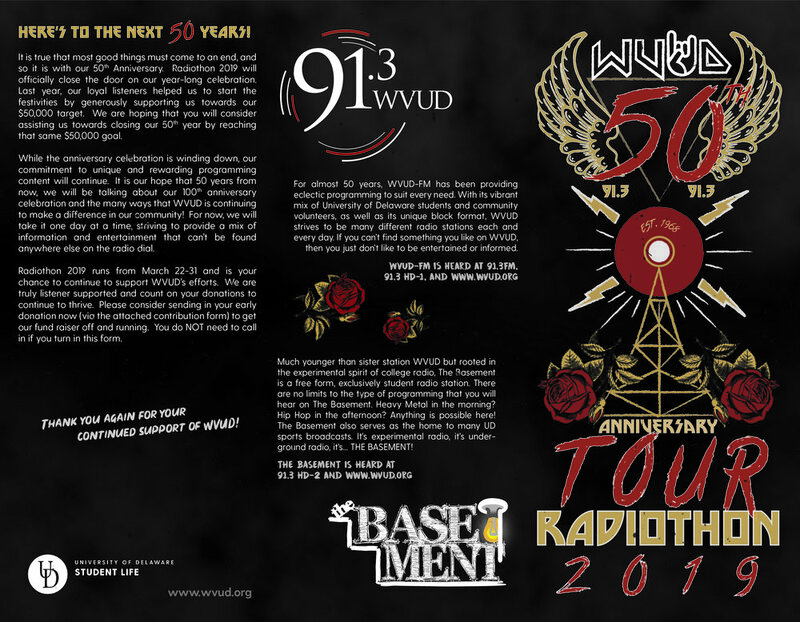 Front and back print pamphlet layout for the 50th Annual Radiothon, a week-long radio program series, hosted by the University of Delaware’s radio station WVUD. Print poster, facebook profile cover, and social media graphic to promote student nominations for the University of Delaware’s annual leadership awards ceremony. Print poster for the University of Delaware’s Saturday night event series Trabant Now, outlining their fall 2018 events. Print flyer and social media graphics for the University of Delaware’s annual Homecoming Banner Competition where various student organizations compete to design the best banner to be hung at the big game.